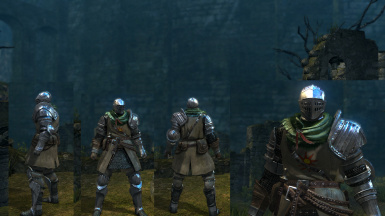 Recolour of Elite Knight set to match Solaire. Elite Knight set appropriated to match Solaire. Edits include matching tabard colour, metal bracer, red feathers, emblem on tabard, comfy green stuff to keep your neck warm, polished chainmail and chainmail socks.